We know people all over the world need help. 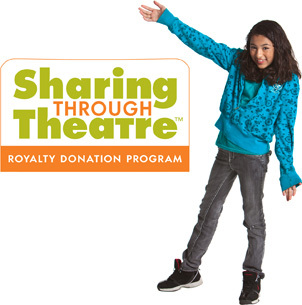 We also know we have the capacity to touch lives through theatre, so Pioneer Drama Service has created the Sharing Through Theatre™ Royalty Donation Program. We have invited our writers to contribute a portion of their royalties to one of four top-rated charities and are matching their donations, dollar for dollar. The response from our writers has been tremendous, and you'll see their generous spirit throughout the website. Red Cross disaster relief focuses on meeting people's immediate emergency disaster-caused needs. When a disaster threatens or strikes, the Red Cross provides shelter, food, and health and mental health services to address basic human needs. In addition to these services, the core of Red Cross disaster relief is the assistance given to individuals and families affected by disaster to enable them to resume their normal daily activities independently. Habitat for Humanity International is a nonprofit, ecumenical Christian organization. We are dedicated to eliminating substandard housing and homelessness worldwide and to making adequate, affordable shelter a matter of conscience and action. Our ministry was founded on the conviction that every man, woman and child should have a simple, decent place to live in dignity and safety, regardless of race, religion, ethnicity or any other difference. Scholarship America mobilizes support for students getting into and graduating from college. The movement began in 1958 with the first Dollars for Scholars chapters. We became a national organization in 1961 — and since then, we've helped more than 1.7 million students follow their dream of getting to college. As we enter our second half-century of helping students, we invite you to come and be a part of our mission. UNICEF is the driving force that helps build a world where the rights of every child are realized. We believe that nurturing and caring for children are the cornerstones of human progress. UNICEF was created with this purpose in mind – to work with others to overcome the obstacles that poverty, violence, disease and discrimination place in a child’s path. We believe that we can, together, advance the cause of humanity.